"Destroy the food machine and the food that it creates"
Are you hungry? Then you will go crazy playing this game. Cloudy Meatballs will get you into odd scenarios with chili, cheese, burritos and other mouth-watering food. 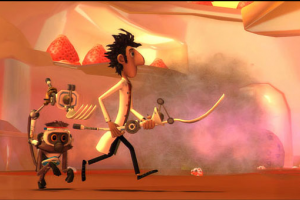 In this adventure game, you will control Flint Lockwood, a young and nutty inventor that has created a machine that turns water into food. It seems like a great invent until he plugs it in to the energy center of the village. In that moment, the machine gets out of control and begins a food rain. Cloudy Meatballs is the video game version of the successful Columbia movie. Your objective will be to destroy this machine and the food that it generates. It sounds strange but this is case: the enemy in this game is food. It will be fun to use the 6 different artifacts that will help you to destroy the machine. That's a different game with a different story. Graphics and music are just perfect for the game play.